The other day I showed an old newspaper headline about a disaster at the Skookum Mine. Was this the Skookum Slope Coal Mine in the Cascade Mountains near Wilkeson, WA (in eastern Pierce County–not far from Enumclaw)? The town of Wilkeson was started up in 1877; the mine was already closed, for the first time, by 1883. Or was this the Skookum Mine said to have been located in Kittitas County near Koppen Mountain? –Which would make a lot of sense as local news for Roslyn, WA. It’s not the Skookum Chuck Coal Fields, I think, which might have been closer to Olympia, WA. It’s not the Skookum Mine in the Yukon Territory. That’s a whole nother story. Either way, the name “Skookum Mine” is an example of boosterism in Northwest English, not of Chinook Jargon. According to various sources including this online biography of Frank Wilkeson, that gentleman was quite the go-getter. He vigorously promoted the area as being the best in the world for timber resources, etc., and eagerly profited from the influx of gold prospectors on both sides of the Cascades following the Ruby Creek gold find. Clearly his mining company carried on this civic (?) enthusiasm in declaring itself skookum. 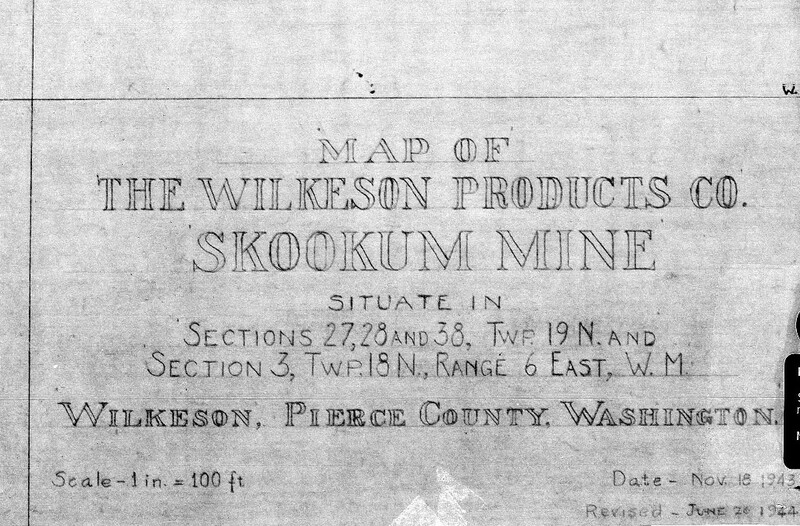 It’s said too that the mine near Wilkeson was named for local Jack Horner of business, Edward S. “Skookum” Smith. My Great, Great Grandfather George Koppen had this mine…My Great Grandfather Leonard Weber was a co-owner as well. Thanks for your note, Brett. So this must be the mine near Koppen Mt. Do you happen to know if the story about its being named for “Skookum” Smith holds any water? I’m sorry, I don’t know how the name was chosen. I did find an old photo of a lumber mill they had near the mine which was wiped out by an avalanche with one fatality…Sort of ended the business!